Tucked away on a tranquil street in the heart of Paris, between Saint-Germain-des-Prés and Montparnasse in the 6th arrondissement, is the beautiful 20th century Victoria Palace Hôtel. Complete with a breathtaking marble hall, typical French decor and timeless atmosphere, the property first opened its doors in 1913. 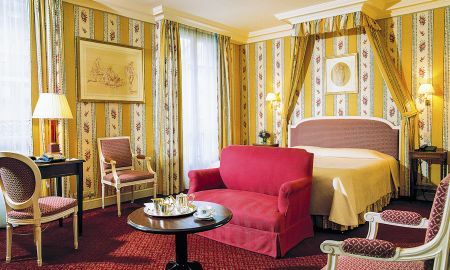 Each of the spacious, luxury rooms measure between 25 and 35 square metres and are decorated in a traditional Parisian style with beautiful cloth-covered walls. Guests can start each day with a delicious breakfast buffet and enjoy free time at the delightful hotel bar. As well as being the perfect base to independently explore Parisian life and the vast treasures of this incredible city, Victoria Palace Hôtel provides exciting tours of the district showcasing the wide variety of markets, shops, chocolatiers, culinary artisans and tiny designer boutiques. 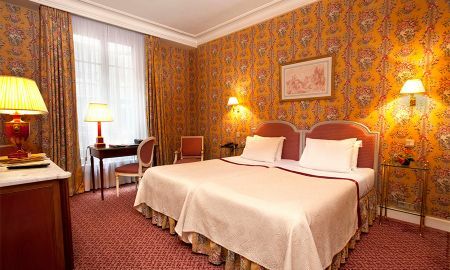 Located between the vibrant rue de Rennes and rue Cherche-Midi on the left bank of Paris, Victoria Palace Hôtel is just a stone's throw away from Saint-Placide metro station and numerous bus stops offering fast, direct services to countless tourist hot spots. The Louvre Museum, Notre-Dame Cathedral and Luxembourg Gardens can be easily reached by foot from Victoria Palace Hôtel.